Until now Prezi templates were not so popular such as templates commonly used by Microsoft in Microsoft Office programs (like PowerPoint templates in Microsoft PowerPoint). 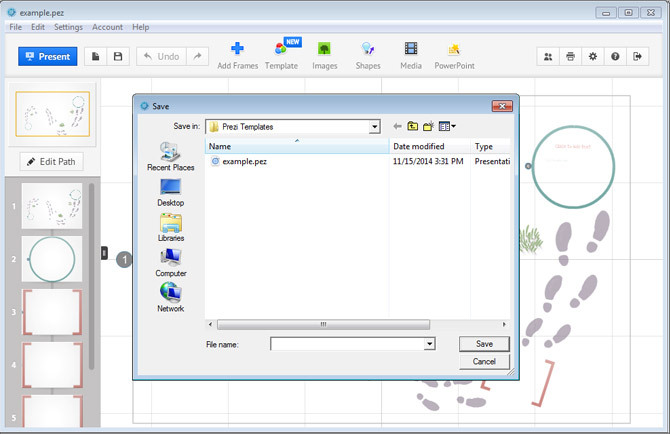 However, using the Prezi Desktop tool for Windows and saving your presentations as .pez you can create Prezi presentations that can be easily distributed and customizable by other people, or what we call: Prezi templates. Here we will show you how to save a Prezi presentation as an editable template. First of all, you’d need to download and install Prezi Desktop for Windows. Then, open the Prezi editor and start editing your presentation. Make sure to add text and image placeholders and when you are done, save the presentation by clicking File -> Save As and then enter a name. As soon as you click Save button in the Save dialog box, the Prezi presentation design will be saved as a .pez file. Now you can distribute the .pez file and work on it as it is a template.